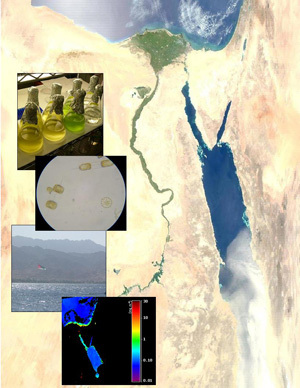 Researchers studied the effects of dust deposited in the Red Sea on the growth of marine algae. Photo credit: K. R. M. Mackey. Dust blown off the continents and deposited in the open ocean is an important source of nutrients for marine phytoplankton, the tiny algae that are the foundation of the ocean food web. But new findings show that some sources of dust also carry toxic elements that can kill marine phytoplankton. Researchers discovered the toxic effects during a study of how phytoplankton respond to atmospheric aerosols deposited in the northern Red Sea. The results will be published in the online early edition of the Proceedings of the National Academy of Sciences (PNAS) the week of March 9, 2009. "This is the first time that toxicity from atmospheric aerosols has been reported for the ocean system," said first author Adina Paytan, an associate researcher in the Institute of Marine Sciences at the University of California, Santa Cruz. "Oceanographers have always thought of dust deposition as good for phytoplankton, because it provides nutrients such as nitrogen, phosphorus, and iron. But we know air pollution has negative effects on the terrestrial side, and we need to think about the effects of pollutants that may be deposited in the oceans," she said. Paytan and her coworkers collected aerosols on filters, incubated the samples with seawater, and observed the responses of phytoplankton. They found that the results depended on the wind direction. Aerosols collected from air masses originating over Europe stimulated phytoplankton growth, whereas aerosols from air originating over Africa, which carried dust from the Sahara Desert, had the opposite effect. Aerosols from both sources supplied key nutrients such as nitrogen and phosphorus, but the Sahara sources also contained high concentrations of copper. "When we added the Sahara dust, the phytoplankton died within 24 hours," Paytan said. "We found that copper was really high in those samples, so we suspected that copper was causing the toxicity." In follow-up studies, the researchers tested the effects of different concentrations of copper on a dominant species of phytoplankton in the seawater. The organisms (a type of cyanobacterium called Synechococcus) died at the same copper concentrations found in the aerosols. Other studies compared different species of phytoplankton and found variations in their sensitivity to copper. "The populations of some organisms crashed, while others breezed right through it. So the effects of copper deposition could change the balance in the ecosystem, allowing less sensitive species to take over," Paytan said. To investigate the global implications of atmospheric copper deposition, the researchers gathered data from various sources on copper concentrations in aerosols, global distributions of aerosols, and aerosol deposition rates. Using an atmospheric deposition model, they calculated rates of copper deposition in different areas of the oceans. They also estimated the contribution of manmade sources of copper compared to pre-industrial rates of copper deposition. Their analysis suggests that manmade sources account for about 40 percent of the copper deposited in the oceans from atmospheric aerosols. Although most of the copper deposition comes from natural sources of dust, the manmade sources are likely to increase over time, Paytan said. In addition, she said, there may be other pollutants in atmospheric aerosols that could also have toxic effects on marine phytoplankton. The modeling study suggested that certain areas--such as the Bay of Bengal and downwind of South and East Asia--are particularly at risk for the effects of copper deposition on ocean ecosystems. The study has several implications for climate change researchers, Paytan said. The amount of dust blowing off the land may change as a result of changes in terrestrial ecosystems. The effects of the dust on phytoplankton growth can be positive or negative, depending on the balance of nutrients and toxins. And as marine phytoplankton grow and photosynthesize, they draw carbon dioxide out of the atmosphere, reducing the atmospheric concentration of the greenhouse gas. "There are a lot of questions to follow up on," said Paytan, who has received funding from the National Science Foundation to conduct follow-up studies. In addition to Paytan, the coauthors of the PNAS paper are Katherine Mackey and Ying Chen of UCSC; Ivan Lima and Scott Doney of Woods Hole Oceanographic Institution; Natalie Mahowald of Cornell University; Rochelle Labiosa of the U.S. Geological Survey in Menlo Park; and Anton Post of the Interuniversity Institute of Marine Sciences in Israel. This research was supported in part by grants from NASA, NATO, and the National Science Foundation. Note to reporters: You may contact Paytan at (831) 459-1437 or apaytan@ucsc.edu.